We’re very proud to introduce our new general manager, who is using her international visitor experience knowledge to push Sacrewell into a new era. Debbie Queen, who hails from the USA but has lived and worked in Scotland and Wales for more than a decade, has big plans for the centre as part of its ongoing development. Having worked at the National Trust for the last 11 years, Debbie says she is looking forward to bringing her ideas to the post. 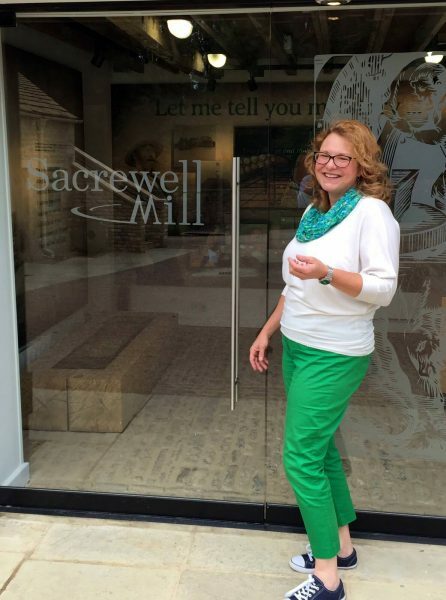 “Sacrewell is a good match for my skills, experience and passion,” she added. Last year Sacrewell, which is owned by the William Scott Abbott Trust, rebranded to expand its appeal to the wider community, and in July reopened its fully restored 18th century grade II* working watermill through a £1.8m project part-funded by the HLF. But, these developments are just the tip of the iceberg, and Debbie has already started the ball rolling for further development of the site and the team of staff and volunteers who run the centre. She said: “I want to bring out the very best of the team, because they are the biggest asset here. I want utilise their knowledge and passions for the charity. “William Scott Abbott was very clear about why he wanted to set up the trust and I want us to carry on that mission. And Debbie’s past experience holds her in good stead to achieve her ambitions. Her most recent post was as the general manager at Erddig Hall near Wrexham where she fronted the Erddig Glow, a Christmas illuminations event which lit up the site and attracted hundreds of visitors. Debbie has moved to the nearby village of Wansford with her husband Brian, a nature conservation consultant, and is planning on spending her spare time exploring the area through their mutual love of heritage, conservation, walking and sailing. To contact Debbie, please e-mail info@sacrewell.org.uk or call 01780 782254.